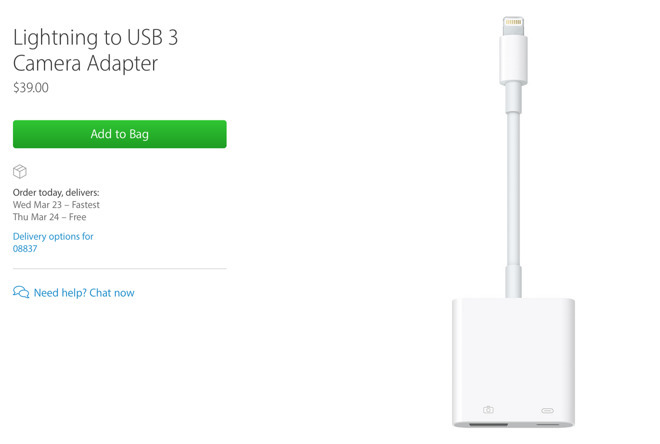 Apple has launched a new Lightning to USB 3 Camera Adapter that features a standard USB port with USB 3 speeds. The company also offers a new Lightning to USB-C cable that is compatible with all Lightning-enabled Apple products for syncing and charging. However, in the description for the camera adapter, Apple notes that USB 3 data speeds are only capable with the iPad Pro. Similarly, the Lightning to USB-C cable will not offer quick charging benefits for any other devices. That means the new 9.7-inch iPad Pro lacks one key feature of the larger 12.9-inch model: It doesn't have a USB 3 capable Lightning port. Still, the new Lightning to USB-C cable gives users the ability to plug their iPhone, iPad or otherwise directly into Apple's 12-inch MacBook, which features a single USB-C port for both syncing and charging.